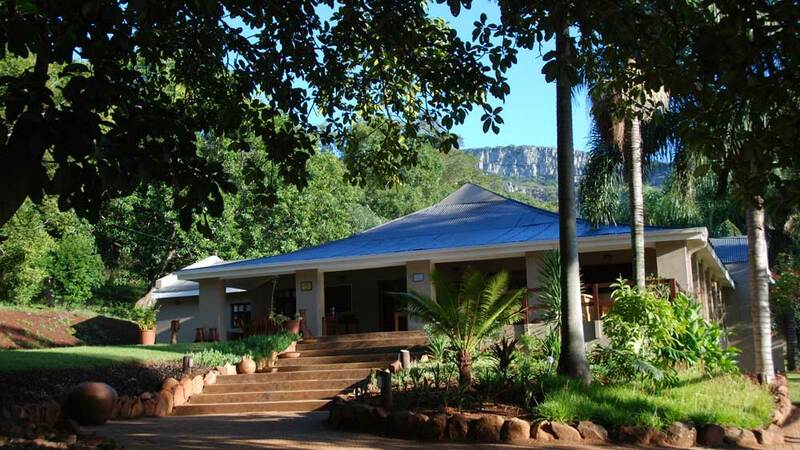 Madi a Thavha Mountain Lodge is an idyllic country retreat and affordable base set in the lush green of the Soutpansberg Mountains of northern Limpopo. Explore the vivid colour and splendour of Venda and Tsonga art, craft, culture and heritage. This lush little oasis is a guest house, gallery of local artists as well as a craft and education centre. Follow signs through colourful villages to the home studios of talented artists, award-winning potters, batik artists and sculptors. Join in workshop programmes: Woodcarving, making traditional clay pots, paper making, musical instruments and visual art such as print making, collage techniques and water colouring. Decorated in vibrant colours, accommodation varies from simple lodge rooms in the main house to a series of farm buildings converted into houses sleeping couples or families. Madi a Thavha maximum occupancy is 20 guests per night. Tasty home cooked meals are served al fresco on the wide verandah of the main building. Comfortable loungers invite relaxation around the swimming pool. Madi A Thavha is one of the four “Pearls of Limpopo” – The circuit includes Leshiba Wilderness, Kololo Game Reserve and Mopane and Madi A Thavha. An additional 10% reduction in cost is available for those booking all four properties in a circuit. Participate in craft workshops, children’s workshops and sewing activities. Experience the vibrancy and creativity of local art and craft in every aspect of the lodge. Shopping – Find unique arts direct from local artisans, no mass-produced artefacts encountered in tourist shops. Childrens activities – Great kids meals, opportunities to learn how to cook bread on a fire or create crafts with the Madi a Thavha design team. 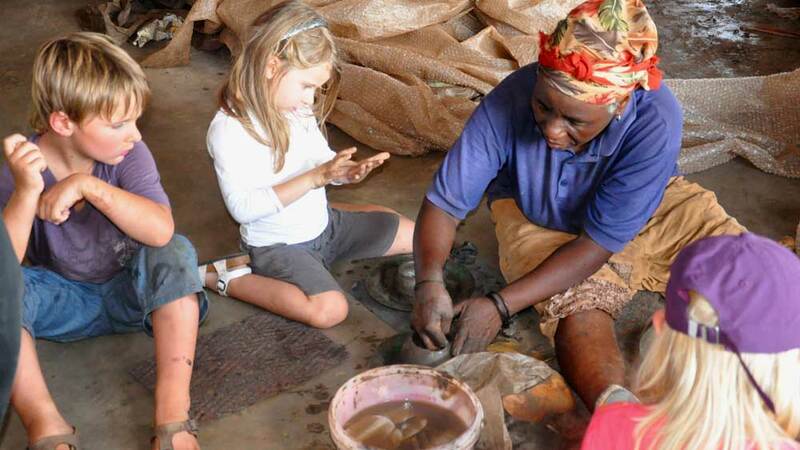 On the Elim art and crafts tour children can play traditional musical instruments and decorate a small clay pot. Fair Trade for Tourism SA (FTTSA) accredited, Madi a Thavha empowers its staff through skills development and ongoing training in areas such as sewing, craft production, business skills and HIV/Aids awareness, to name a few. The business is extensively involved with its community, in particular through arts and crafts mentoring programmes, while the entire Madi a Thavha team participates in on site environmental education activities. Dutch Owners Aart and Marcelle care, really care, down to the roots of their hair follicles about the music, art and craft of the Venda and Tsonga. Their commitment to supporting the arts in Limpopo is remarkable as is the relationships they have forged with local artists. They run a gorgeous country retreat at ridiculously good value for the quality of accommodation, food and service offered to guests fortunate enough to discover this genuine african treasure.